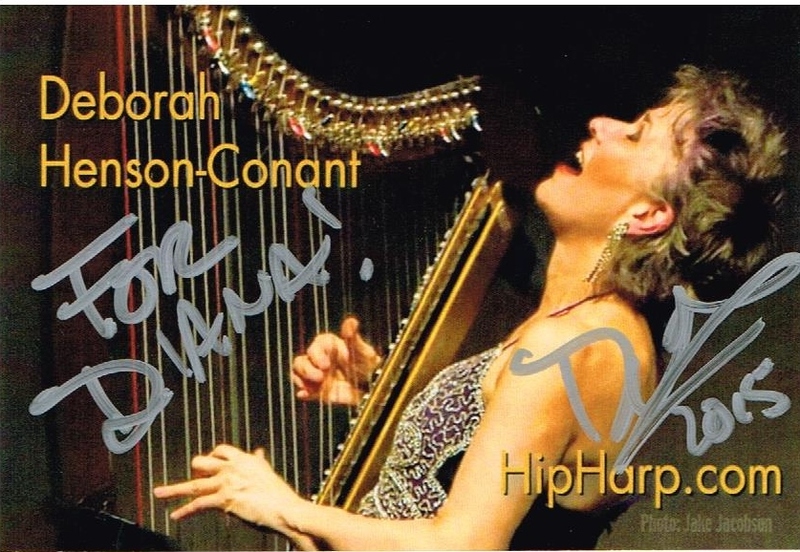 When I first saw electric harpist extraordinaire Deborah Henson-Conant on stage, I thought, “Really? You’re wearing that?” Okay, so I’m not terribly enlightened. My friend said to me later, “I really admire people who aren’t afraid to be different.” I thought I was, too, and, maybe it was just the mood I was in that night, but the black mini skirt and the bejeweled bra more-than-peeking out from underneath a black vest seemed a little much to me. Her first song, however, helped to change my mind—a little. Sung in robust, joyful and bluesy tones, Never too Late is an anthem about how we may not be able to reach the highest heights of certain professions (like being an opera singer at the Met), but that, no matter how late in life it seems to be, one shouldn’t be afraid to live one’s dream the best that one can. I liked that idea, but I still didn’t get the outfit. It wasn’t until the next day when I was in her improv workshop that I began to understand. The outfit was a way of making herself ready for the stage. And gosh darn it, why shouldn’t she wear that if it worked for her? The workshop as a whole was very useful, and I can’t help but imagine that Henson-Conant’s online classes (though I have not tried them) are equally helpful. I also really appreciated her candor and humor. She told us stories about times in her career in which she had been assured by well-meaning members of her circle that she was going to ruin her career if she did x, y, or z (some of which had to do with her, ahem, stage garb). She revealed that she has faced what we all face, the fears of not being accepted and the painful choice between following what feels like our true path—which is often winding and incalculable—and the assurances of success so often offered by “playing it safe”. But what struck me most about what Henson-Conant had to teach us was her insistence that it doesn’t matter what your level of proficiency is. What matters is knowing what your good at, working from that place, and allowing those abilities to bloom into bigger and better things. Because, by reaching for abilities that are (for the moment, at least) beyond our grasp—believing that only when we can accomplish certain things will we be fulfilled—we discount who we already are and all that we already have to offer. 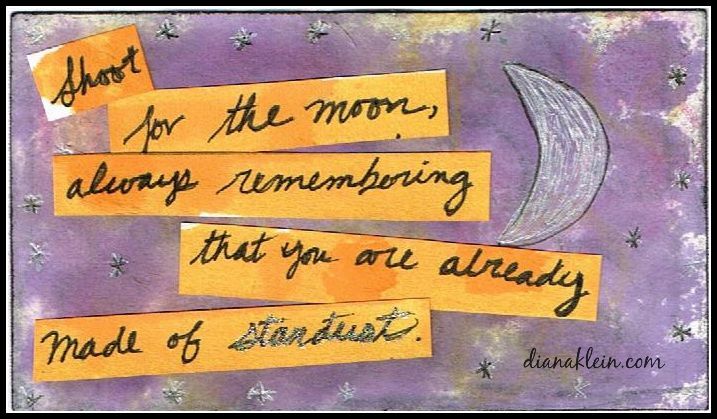 So yeah, shoot for the moon—always remembering that you are already made of stardust. And if you feel like wearing mini skirts and spangles, then go for it—and enjoy the heck out of it! If you enjoy this blog, please consider sharing it with a friend or even subscribing. Thanks and have a great day!